MashSF is putting two events including the Twin Peaks Time Trial on Sunday (which includes a race for geared bikes, too) And who can forget the high profile Red Bull Ride+Style event this Saturday. This all happening in the city which I first spied a One Less Fixie sticker 6 years ago. 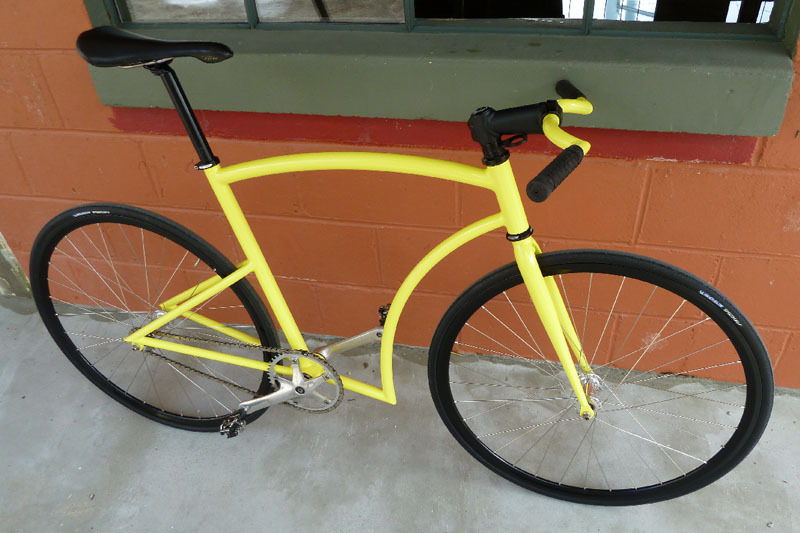 If the collective passion for fixed gear is losing steam, it is doing it very slowly. The "rage" of fixed gear haters may peter out first at this rate. 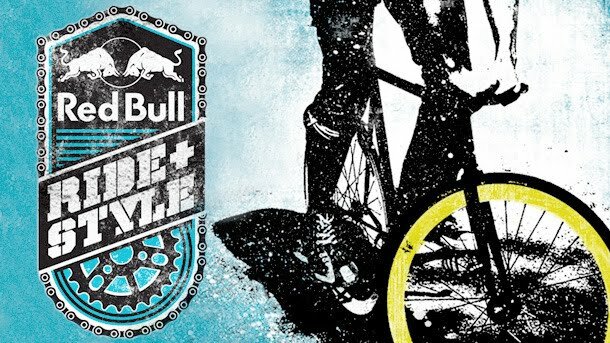 We are totally looking forward the Red Bull event.... not just to see the some of the more talented riders from around the world, but the art as well. We have released two more saddles inspired by Italian classics (sorry if that sounds like an Olive Garden reference). Each are available in smooth black or white, or black micro-suede synthetic covers and have satin finish CrMo rails. The Kyudo has firm padding with a slightly concave top when viewed from the side, which encourages riders to settle into the sweet spot. You can also pitch the angle forward a little to create a slope that you can push against when climbing in the saddle. 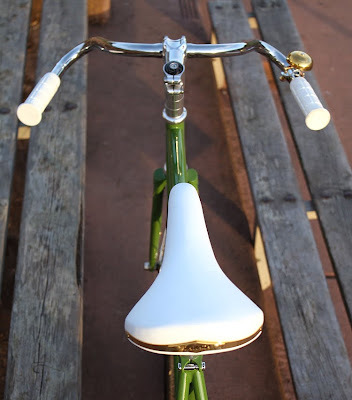 Definitely will not feel like those flat minimalistic saddles out there. This week we are offering a special introductory deal on these at the Soma Shop. 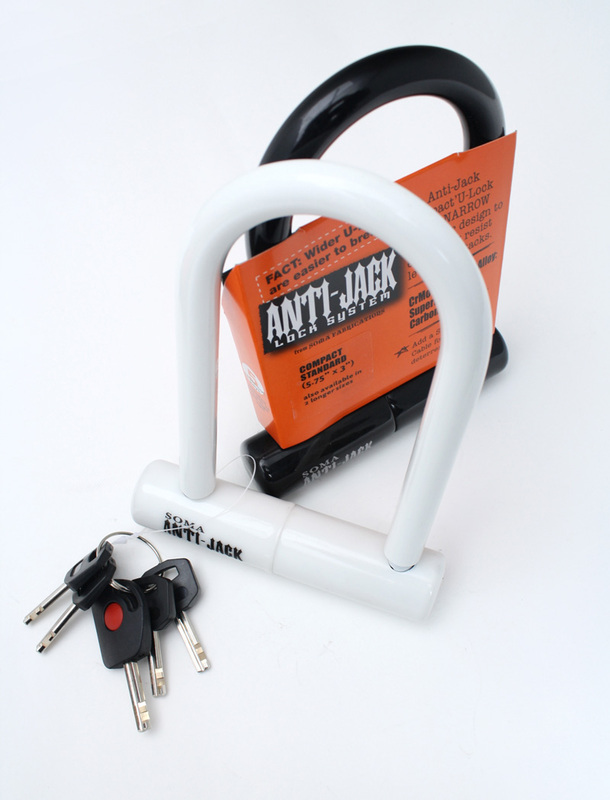 These will also be available through local bike shops. 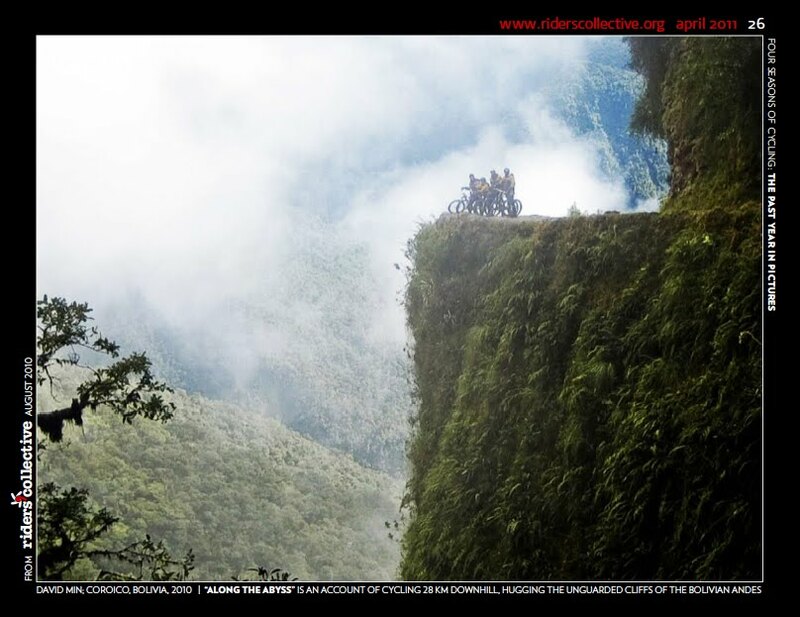 Rider's Collective, the webzine that samples some of the best cycling blogs, tips, reviews, and photographs from the web (done with the blessings of the authors) just sent a link to their "year in pictures" issue. A nice lunch time diversion. Please visit. Dennis from Fixed Gear Gallery sent us this pic of a custom Shorty Fatz (now POPS Fabrication) 8-series frame he's testing. He was must've noticed how the lines of our Italian cafe racer- inspired bar complemented the unique-looking frame and asked us for one. Look for the review soon. All their POPS frames are fillet-brazed in San Jose, CA. Hoopdriver in lovely Toronto, Canada only started stocking Soma Fabrications last year and the shop itself will only be celebrating anniversary no. 2 this April 25. Happy Anniversary, Martin! 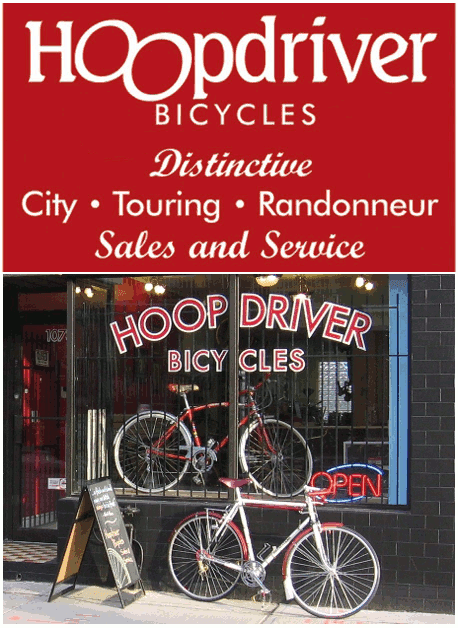 Hoopdriver Bicycles is sees itself as providing bicycles, parts and accessories that are functional, smart, durable and attractive.They make a special effort to also source and stock unique products that are difficult to find elsewhere. 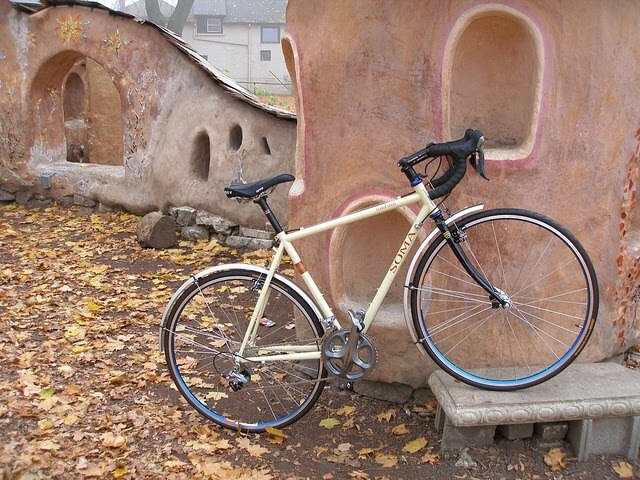 They carry a number of touring, randonneuring and commuting bicycles. They recently built a number of gorgeous Somas that we want to share with you. Click here to view his Flickr sets of these bikes and others. 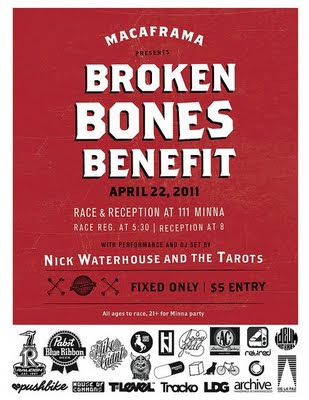 First is the Macaframa race and reception benefiting the fund for injured bicycle messengers. That is tonight. The second event, which celebrates that original brakeless fixed gear machine, the Big Wheel. The event known as BYOBW (Bring Your Own Big Wheel) has contestants doing some serious hill bombing on Big Wheels. 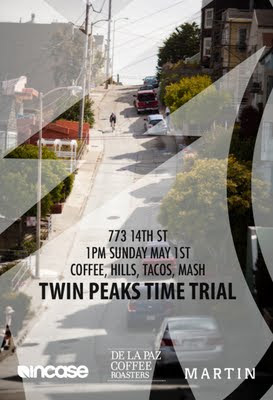 (2010 video edit below) Easter Sunday, April 24th, 2011 20th and Vermont Street San Francisco, CA 3pm. Free to enter, but you MUST sign a waiver to compete! Both these events are for "fixed only". Yes, we've gone n' dunnit! Made our hardened CrMo Anti-Jack mini U-Locks in WHITE. For those who are going to raise a fuss, go ahead — we love to fill up our comment section. The NYC messenger reality series "Triple Rush" premieres tonight on the Travel Channel as if you didn't know already. 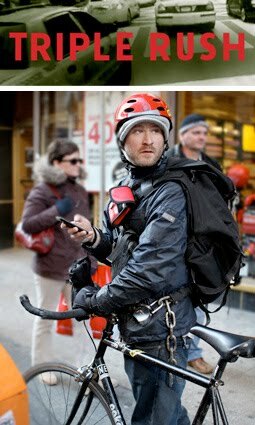 I think it's gotten just as much press as "Premium Rush" if not more. To celebrate the premiere, the SomaFab shop is offering a not-to-be-repeated killer deal on the slick black Soma Rush fixed gear frame. For the next three days, most likely you won't find a cheaper price on the internet. Sure it doesn't have fancy cut out fork ends or do bar spins or have our new headbadge, but what it is though is one of the few remaining CrMo frames with heat-treatment and a sub 4.25 lb weight. 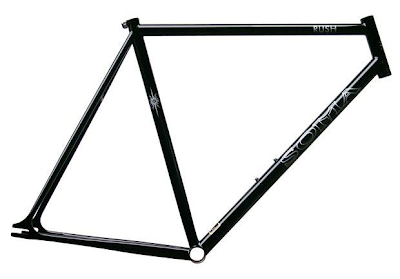 You get the sharp handling geometry of a velodrome racer with the lively ride quality that heavier (cheaper) steel tubes just can't duplicate. Offer must end Sunday night! 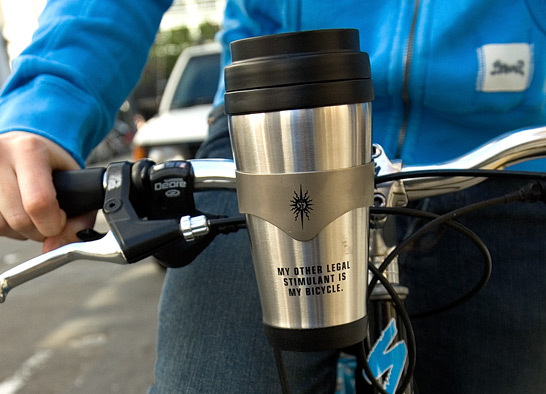 Also we'd like to announce we are finally offering our Morning Rush Coffee Holder without the travel mug. It still has the same stainless steel ring and the angle adjustable Cat Eye quick release mount that other coffee holders don't have. If it will make your weekend, we'll knock off a couple bucks on that as well. Why not? but we're dropping the price way lower. That would've made a good April Fool's headline. 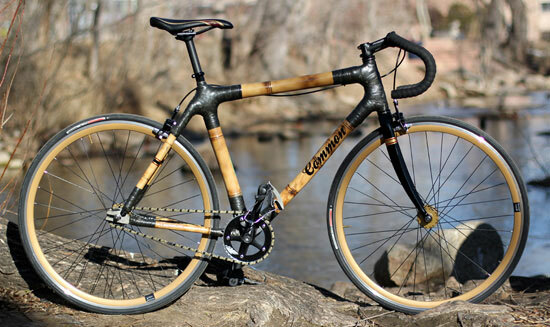 The truth is we are still into our love affair with steel, but if you aspire to be in the bike biz there is an true opportunity for enterprising, motivated, and talented individuals to get in on the starting up of a new bamboo bicycle brand. I find this project inspiring, because I love to see underdog ventures like this catch fire and hope they will connect smart individuals and allow them to break out cubicle-bound lives to collaborate on something cool. The outfit is called Common Cycles (aka Project M Lab). While current bamboo bikes are made of imported bamboo, Common is not only trying to create to manufacture bicycles, but help establish bamboo farms in Alabama -- to create a new cash crop ("Alabamboo") for that state. Gotta love that. If you aren't the entrepreneur-type or thankfully already have a job they like already, but are still intrigued by bamboo bikes, you can make one yourself in you are in the SF Bay Area or Brooklyn... where there are Bamboo Bike Studios to teach you how to construct your own frame. I'll take one in that green color in House of Flying Daggers. Modern steel forks are generally incredibly stiff and not as comfortable as older designs (especially those trendy straight blade ones). "But stiff forks make for better for handling!" you say. To which I respond, "What if you can have the comfort without sacrificing hardly anything in the handling department?"... You then fall speechless to the ground and kiss my feet.. 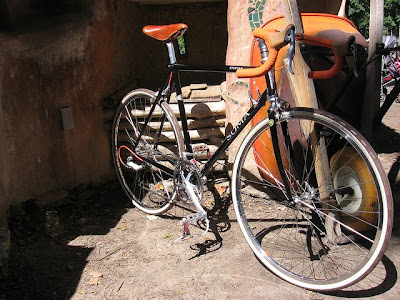 The same thinking that led us to steel frames led us to the creation of the Classic Curve line of chromoly steel forks. We drew our inspiration from forks found on old Peugeots, Raleighs and Motobecanes. The main difference between Classic Curve forks and our current curved forks is the bend in the blade is concentrated in the lower part of the blade. 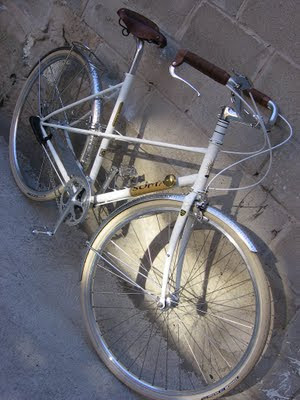 They give any bike a vintage look, but the offset(rake) is the same as our other forks, so that steering stays crisp. Right now we have: two road fork versions(for 49mm and 57mm reach brakes), a track version and a cyclo-cross/trekking version. 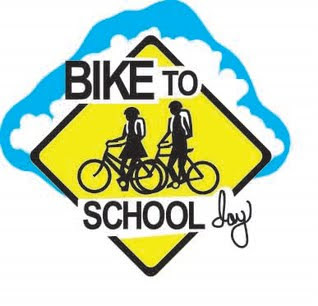 Thursday, April 7, will be San Francisco's third annual Bike To School Day. The above video shows how many kids participated from Monroe Elementary School last year. Record turnout is expected, thanks in part to a tripling in size of the citywide San Francisco Safe Routes to School program, which organizes the event. One of my favorite articles are on cyclo-cross came out this magazine. It is also awesome for whetting your cross-cultural wanderlust. Did you know you can read Wend magazine–from the very first issue to the most brand-spanking new–online, for free? But if you’re not already signed up to read Wend digitally, this is the week to do so–because in addition to getting the green, guiltless pleasure of instant, on-screen Wend–you could win a 16 oz. insulated Klean Kanteen .